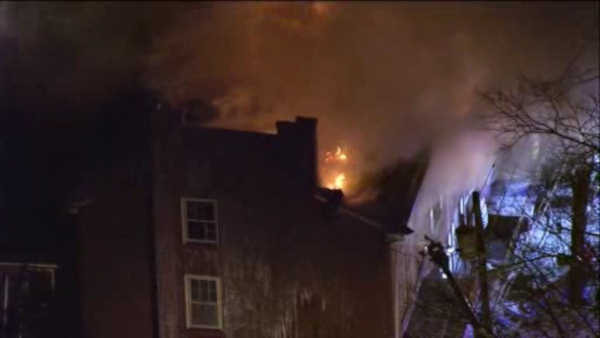 3 hurt, 4 homes destroyed in large fire in Burlington City, N.J.
BURLINGTON CITY, New Jersey -- WPVI-TV is told three people have been hurt in a large fire that has destroyed four homes in Burlington City, New Jersey. The blaze broke out at 5:30 a.m. at a home in the 300 block of St. Mary Street and soon spread to three others. Images from Chopper 6 HD showed heavy flames shooting through the roof of one of the homes. A second alarm was sounded a short time at about 5:45 a.m.
Action News is told three people have been taken to Our Lady of Lourdes Medical Center in Willingboro. One suffered burns. The other two were being treated for smoke inhalation.